I am having a late start on planting this year, and spring seems to be coming early. During the weekend I stopped by American Soil and Stones to get more soil for the vegetable beds. I normally get Ultra Potting Mix or Ultra Bedding Mix, and they are $9 and $8.75 a bag. I decided to look at their price list carefully to see whether they have cheaper mixes. 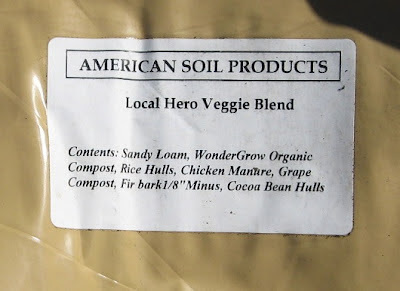 I was surprised to see that they also have "Local Hero Veggie Garden" at $6.50 per bag. 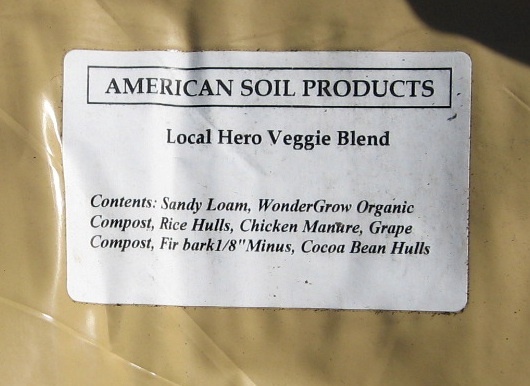 It contains several kinds of compost and chicken manure. That sounded perfect. I got a few bags and even mixed in some Dusty's poop as I filled up my veggie beds. I wanted to get the snow peas into the ground but I had to figure out where and what they can climb. I have planted them next to the the arbor in the past, but I want to save the arbor for passion fruit. Last year I planted the snow peas in a wine barrel all the way in the back of the farm. I don't want to do that this year because I want to keep all the vegetables in one area for easier access. Besides, I might want to put in another fruit tree at the spot where the wine barrel is. So, I decided to use a piece of left over material from the arbor to make a 5-foot-tall trellis for the snow peas. I know snow peas usually grow much taller, but I can't get to the peas high up anyway. There's no reason to create more work for myself. It happened to be a very windy day today, so this trellis got blown over several times as I tried to stabilize it. At the end, it stood its ground regardless how hard the wind blew. Now I know it will be safe for the season. It's not the most beautiful thing I have ever put together, but it is functional, sturdy and didn't cost me anything. I can't wait for the snow peas to start climbing on it!